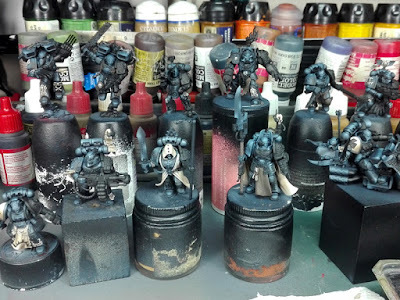 Javier González "Arsies", Miniature Painter: Painting DeathWatch Army: Week 2; #Warmaster's Crusade. Painting DeathWatch Army: Week 2; #Warmaster's Crusade. Recently, Volomir.com presented their challenge "Warmaster's Crusade". Basically, a couple of painters have a limited time to complete a 1000 points Warhammer 40.000 army. Do you want to know what happened in week 2? First of all, remember I dis a grisaille painting and then filtered with a dark blue sea to achieve my "black" armours colours. LAter I started the shadow outlines and some black basecoats. But I couldn't end this step on the 12 marines, so I started completing this step. After that, I suffered a strong backache and my neck becomes blocked so I couldn't work a couple of days. That meant a delay so I couldn't do so many steps more. Once I finished the black work on the 12 Marines I started to add a "white" basecoat to this colour elements. I used a mixture of Andrea's second light (flesh set) + burnt umber + English uniform. It's quite hard because it doesn't cover fine over a dark colour. If I do it thick then the brush strokes should be visible, and in thinner coats, I need to repeat this step up to 5 times. Then I painted with the brush in a dirty way the shadows using different mixtures of the base colour and burnt umber. I tried to dotting to add texture. Later I repeated the shadows with dotting by airbrush with the same colour and finished the inner work using the brush. Next step is to paint shadows outlines and also, some writing on seals, and finishing with a pale grey painting the light outlines. 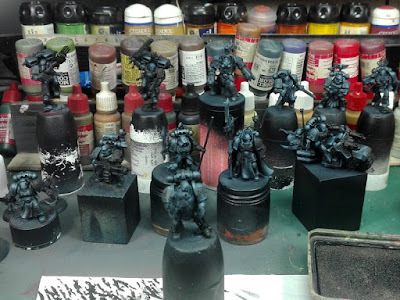 And finally working also on weekend I could finish this step on the 12 marines.